How a new person starts their Juice Plus+ Virtual Franchise is really important. Some start with a clear vision, goals and a plan, and they complete their Fast Track in 30 or 60 days. The way you start sets the pace for the rest of your business and personal growth, and sets the pace for your future team. Faster is better! 1. Why do some start with a clear goal, and others don’t? 2. How do a few of those who don’t, still manage to Fast Track with no initial plan to do so? 3. How can we better help our new Team Members clearly see the benefit, the advantage and grasp the opportunity to get off to such a great start? Before we discuss those questions, let’s explain “Great Expectations”: see the photo here. 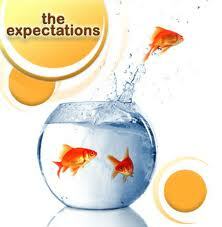 With NO expectations, those two fish have no dreams, no goals, no plans — a sad fishbowl of a life! It’s the same in this business … the result is a sad business! With Great Expectations, like that goldfish, you can escape the limiting goldfish bowl of your life to Freedom – as we did. In 1990 I only saw one destination: National Marketing Director, and achieved it in 4.5 years – not fast but just fine! Great Expectations = Great Hope for the future. We all need that! 1. Why do many people start their JP+ Virtual Franchise with no or low expectations? Every one of us brings a set of expectations to each experience. Those expectations may be conscious or unconscious. They may be general or specific. They may be vague or clearly defined. Regardless, no-one comes to any new experience without some kind of expectation. It’s just the way the human mind works. In life, each successive WOW experience or each successive disappointment creates a new threshold for the next one – either higher or lower. them). We should weed “inspiration-killers” out of our life. Detach yourself as much as possible from the things that discourage and drain you. From where do your best ideas come? When do they come? What inspires you? Identify the things that bolster your faith and make you want to attempt great things, and then incorporate them into your weekly routine. I set aside specific times of prayer and Bible reading because those activities inspire me to attempt great things for God. to be willing to fail along the way. John Maxwell wrote a great book on this subject called Failing Forward. As Thomas Edison famously said, “I am not discouraged, because every wrong attempt discarded is another step forward.” Every technique, venture, process, or idea you try is not going to work. The key is to learn from the ones that don’t, and constantly improve. Which is better? Great Expectations, but with some risk of failure? Or No Expectations (because it’s safer) which leads to no effort, but no Success? 2. How do a few of those who don’t start with any expectations or goals still manage to Fast Track? How strong is YOUR Belief? Can you pass that on to your newbies, can you infect them with your belief?! If a new JP+ Rep. starts with excitement and commitment, focus them on their 60 day deadline to win a $350 cash bonus. instead of asking for 50 – 100 names on their Memory Jogger, ask for 20 (they will add more later). start with their address book (on their cell phone and/or computer). work with them and those 20, identifying one or two for their future Dream Team. help them get their first Preferred Customer order outside their own household (that builds confidence). keep them focused on the deadline date for their Fast Track. a. Why would someone be interested in JP+, unless I have a great Story that justifies great expectations for them? b. Why would someone be interested in my business, unless I have a great Story that inspires them? Starter Guide is a great tool to help you and your new Rep. write compelling Stories – just make sure you communicate your own great expectations through your story, which will then inspire their expectations, their Stories and inspire other people. Example 1: my Juice Plus+ Story (marathon running, immune system rebuilding) gives people hope. family financially while staying at home with the children. As a sponsor what should your role be and how can you perform it at your very best? Unless you have your own Great Expectations – a great dream, great goals and a great plan that you are excitedly working on – and unless you communicate them AND share your Belief that your new teammate CAN DO THIS, then you are leaving their success to chance. Invite them to Events and on Connection Calls – these build vision, provide inspiration and build greater expectations. With Great Expectations, we have great dreams, goals and plans and we take GREAT action. Our expectations are important, because they reflect some inspiration/the vision that we have; they determine our attitude about the future, and they inspire action and effort. Great Expectations lead to Great Trying, great effort in us and others. So, if you still have low expectations yourself, if you’re still afraid of failure, you should understand that you will have some failures, some disappointments. So how do you Discipline those Disappointments? Know that Failure is a gateway to new things. It’s the stepping stone to new life. Seen properly and discerned rightly, our failures will be the very things we look back on with affection, thankful for a God who lets dreams die, reworks them, then creates wildly beautiful life from their death.